Acute deterioration in kidney function in a patient with cirrhosis and ascites presents a difficult management problem, and it is associated with increased mortality. In this Attending Rounds paper, a patient with oliguric AKI is presented to emphasize the role of laboratory and bedside tests that can establish a correct diagnosis and lead to appropriate management. A 43-year-old former nurse with a past history of heavy alcohol abuse was admitted to her local hospital with fresh hematemesis. She was stabilized, and at endoscopy, she was found to have bleeding varices, which were successfully banded; 4 days later, she became confused and agitated. Repeat endoscopy did not show any active hemorrhage, and because her condition did not respond to lactulose and metronidazole, she was transferred to a liver transplant center for additional assessment. On arrival, she was icteric; her temperature was 98.5°F (36.9°C), with a respiratory rate of 18 breaths/min, a pulse of 70/min, and BP of 106/65 mmHg (mean arterial pressure of 78.3 mmHg). Jugular venous pressure was only just visible at 45°. Her weight was estimated at 187 lbs (85 kg), with a body mass index of 31.2. Finger probe oxygen saturation was 97%. She was somnolent, nonconversant, and difficult to arouse but oriented to being in the hospital; she could not specify which hospital, and she responded minimally to her first name. Extremities were warm. Cardiac auscultation was normal, lung fields were clear, and her abdomen was distended with a moderate amount of ascites; the liver edge was palpable two finger breadths below the right lower ribs. There was no splenomegaly. There was bilateral pitting edema to the mid-calves. Her hemoglobin was 7.9 g/dl, with an elevated mean corpuscular volume of 103.9 fl, a total white blood cell count of 16,000 (85% polymorphonuclear leukocytes), and reduced platelet count of 79,000×109/L. Initial laboratory investigations are shown in Table 1. Prothrombin time (20.6 s), normalized international ratio (1.8), and activated partial thromboplastin time (41.3 s) were prolonged. Fibrinogen level was normal. An ammonia level was elevated at 38.3 μg/dl (normal<28 μg/dl). Additional investigations revealed a positive antinuclear factor in a titer of >1:1000 with a homogeneous staining pattern; a double-stranded DNA antibody test was normal. Tests for antibodies to hepatitis A, B, and C and other autoantibodies were negative; drug and toxicology screens were also negative. Analysis of ascitic fluid revealed 300 red blood cells per 1 μl and 100 white blood cells per 1 μl but no organisms on Gram stain. Urine dipstick testing noted orange urine, strongly positive for bilirubin, with a specific gravity of 1.015, pH of 5.5, trace protein and blood, no glucose or ketones, and positive results for both leukocyte esterase and nitrites. Urine microscopy revealed 0–2 red blood cells and 5–10 white blood cells per high-powered field, some hyaline casts, and a few bacteria. Urine protein was <15 mg/dl. Urine sodium was 45 mEq/L, with a fractional sodium excretion of 0.8%. Fractional urea excretion was 18.8%; 12-hour urine volume was 410 ml, with a urinary creatinine clearance of 71 ml/min. Calculated estimated GFR was 80 ml/min per 1.73 m2 using the Modification of Diet in Renal Disease equation. Urine drug screen was negative. Chest x-ray showed splinting of the hemidiaphragms with clear lung fields. Abdominal ultrasound confirmed the presence of ascites, an enlarged liver with a patent portal vein, and splenomegaly; renal size was normal with an increased resistivity index of 0.76 (normal<0.7). The noncontrast computed tomography scan of her head showed a mild degree of cerebral involution, and the abdominal computed tomography scan did not show any evidence of hepatocellular carcinoma. Standard transthoracic echocardiography estimated a right atrial pressure of 10 mmHg, with an ejection fraction of 63% and inferior cava width of <1.5 cm with normal variability with respiration. Cultures of urine, blood, and ascites were obtained, and she was started on empirical intravenous antibiotics with piperacillin-tazobactam. She was also given vitamin K. Because she was thought to be intravascularly volume-depleted, despite the presence of peripheral edema and ascites, intravenous albumin (1 g/kg) given in 100-ml aliquots of a 20% solution followed by 20–40 g/d was administered. Despite this administration, her BP remained low (95/60 mmHg; mean=70 mmHg). A plasma cortisol level was 5.2 μg/dl, which increased normally at 30 minutes in response to a synthetic ACTH stimulation test to 17.3 μg/dl. Urine culture revealed Escherichia coli>105 colony-forming units per milliliter; all other cultures were negative. The serum creatinine continued to increase despite appropriate antibiotic treatment and albumin infusions (Table 1), and she remained oliguric. Terlipressin infusions were started on day 5; initially, the infusions were 0.5 mg three times per day, and they were gradually increased in a stepwise fashion to 4 mg three times per day. In summary, this patient with chronic liver disease and a history of previous heavy alcohol abuse was admitted to the hospital with bleeding esophageal varices. Despite stopping the bleeding, her condition deteriorated with development of hepatic encephalopathy and persistent hypotension, despite negative blood and ascites cultures in the setting of aggressive volume resuscitation with intravenous albumin and fluids and onset of oliguric AKI. Patients with cirrhosis initially have increased portal circulation, predominantly because of increased local nitric oxide production, which contributes to the development of ascites (1). 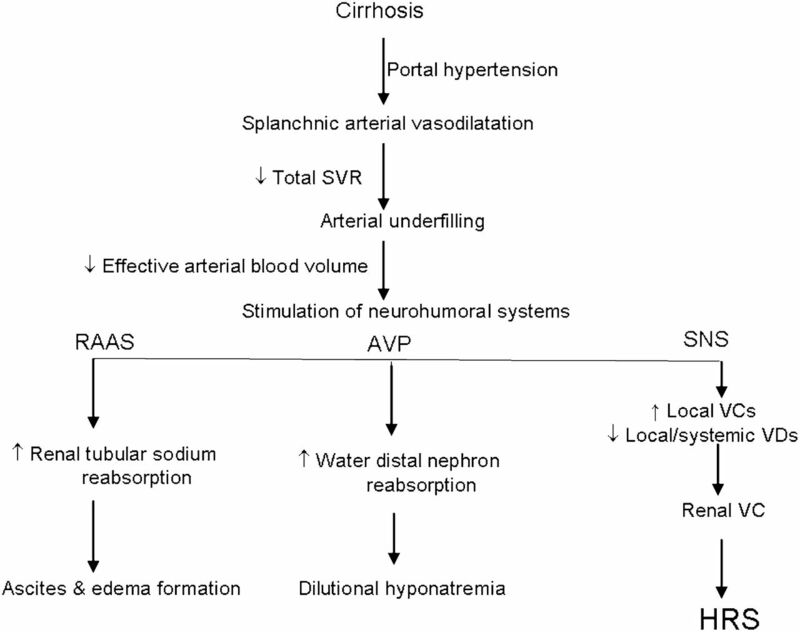 As cirrhosis proceeds, excessive nitric oxide spills over into the systemic circulation, leading to systemic vasodilatation and activation of compensatory neurohumoral systems (Figure 1). Cardiac output initially increases in response to systemic vasodilatation (2), but as the disease progresses, compensation fails to maintain an adequate circulation and blood supply to vital organs, such as the kidney and brain; exacerbated by changes in renal autoregulation (Figures 2 and 3), the organs becomes compromised (3,4), leading to AKI and encephalopathy. The alterations in renal blood flow and renal autoregulation are predominantly caused by excess visceral sympathetic nervous system activity coupled with increased intrarenal vasoconstrictors, such as endothelin. AKI in this setting often seems to be triggered by intercurrent events, such as large-volume paracentesis, bleeding, sepsis, and exposure to nephrotoxins. Pathophysiological changes that occur in patients with progressive cirrhosis. AVP, arginine vasopressin; DCT, distal renal tubular cell; HRS, hepatorenal syndrome; Na, sodium; RAAS, renin angiotensin aldosterone axis; SNS, visceral sympathetic nervous system activity; SVR, systemic vascular resistance; VC, vasoconstrictor; VD, vasodilator. Changes in renal autoregulation in patients with chronic liver disease (CLD) and HRS. Modified from references 3 and 4, with permission. Management algorithm for a patient with HRS. Traditionally, it was assumed that most patients with cirrhosis had normal kidney histology. However, it is now recognized that there are often ischemic changes and other minor histopathologic abnormalities in the glomeruli (5). Some patients have more well defined underlying glomerular pathology associated with concomitant viral hepatitis or deposition of IgA with a mesangioproliferative pattern on light microscopy. This latter presentation, seen particularly in patients with alcohol-related cirrhosis, is thought to be caused by abnormal IgA glycosylation (6). Patients with cirrhosis caused by Wilson’s disease and primary biliary cirrhosis predominantly have interstitial renal disease. In other patients, renal histopathologic changes secondary to systemic hypertension and diabetes may be seen. Intra-abdominal pressure may be increased in patients with cirrhosis because of the presence of tense ascites. Although a typical compartment syndrome causing AKI may be associated with intra-abdominal pressures of 18 mmHg or greater, lower pressures can cause renal dysfunction, especially in the setting of systemic hypoperfusion or sepsis. As such, renal perfusion, which was shown by improvement in the renal resistivity index on renal color Doppler examination, has been reported to improve after drainage of ascites (7). Overzealous removal of ascites, even with colloid replacement, can lead to intravascular hypovolemia and ischemic AKI; therefore, paracentesis for other than diagnostic purposes should be undertaken cautiously, unless the ascites are causing the patient discomfort (8). There are no prospective trials investigating the effect of changes in intra-abdominal pressure, systemic BP, and outcome in patients with hepatorenal syndrome (HRS) after paracentesis. Our patient had a history of alcohol abuse, and although she may have had glomerular IgA deposition, urine dipstick testing and microscopy did not show significant hematuria or proteinuria, making an IgA-associated glomerulonephritis unlikely. There was no history of administration of nephrotoxins, and drug screens were negative. As such, the primary differential diagnosis lay between volume-responsive and -unresponsive AKI. HRS is a specific form of volume-unresponsive kidney injury in patients with progressive cirrhosis and ascites (Table 2). Criteria for the diagnosis of HRS have been proposed (9) and subsequently revised (10), but they have not been universally endorsed. Before giving a fluid challenge to determine whether our patient had volume-responsive AKI, we would need to decide how much fluid to give based on an assessment of her intravascular volume status. Assessment of intravascular volume in patients with cirrhosis is difficult, and even invasive monitoring, including hemodynamic measurements of central venous pressure and pulmonary capillary occlusion pressure, is not necessarily a reliable marker of circulatory volume (11), with little or no change often observed in these static pressures despite colloid volume expansion (12). Other potential techniques that could help assess volume status include use of ultrasound to measure inferior vena cava diameter and echocardiographic assessment of right atrial and ventricular volumes (9). We performed a transthoracic echocardiogram, which estimated a normal cardiac ejection fraction and elevated right ventricular end systolic pressure of 38 mmHg, and dilated the right atrium with normal inferior vena cava diameter and collapsibility in keeping with the hyperdynamic circulation of patients with acute or chronic liver failure. Despite the presence of ascites and peripheral edema, we felt that this patient was probably intravascularly underfilled; therefore, she was given an intravenous volume challenge with a series of boluses of 20% human albumin solution up to 1 g/kg over the next 24 hours. We observed the response before administering the next bolus (13). A 20% albumin solution contains less sodium than the more standard 4.5%–5.0% solutions, and it is, therefore, generally preferred in this setting. In addition to serving as an intravascular volume expander, albumin also has binding sites for free radicals and toxins, and hence, in patients with liver failure, albumin infusions may help by increasing the capacity to bind such toxins (14). Although intravenous infusion of crystalloid solutions can usually be safely given to patients with cirrhosis because of their systemic vasodilatation, any fluid bolus that initially expands the intravascular space will subsequently distribute to expand the entire extracellular space, worsening peripheral edema and ascites. Overzealous fluid administration can also precipitate cirrhotic cardiomyopathy with heart failure (15) and hypoxia because of hepatopulmonary syndrome (16). Our patient had a normal cardiac ejection fraction but diastolic dysfunction on echocardiography, which is a common finding in patients with both alcoholic and nonalcoholic cirrhosis (15). She also had normal oxygenation and appeared able to tolerate aggressive volume resuscitation with intravenous fluids and albumin. Creatinine is derived from creatine, much of which is synthesized by the liver. As such, patients with liver disease tend to have lower creatine synthesis and consequently, lower serum creatinine values for any given level of GFR. These lower values are compounded by the loss of muscle mass that is common in patients with progressive chronic liver disease; they often also have a degree of creatinine dilution caused by the accumulation of peripheral edema and ascites. Clinical chemistry laboratories typically measure serum creatinine by a modified Jaffe colorimetric assay, which depends on a color change that can be influenced by noncreatinine chromogens such as bilirubin, particularly with serum bilirubin concentrations≥10 mg/dl. This effect of bilirubin reduces the measured creatinine value. Therefore, serum creatinine and estimated GFR calculated using serum creatinine overestimate actual kidney function. Likewise, an increase in serum creatinine concentration of 0.3 mg/dl (i.e., corresponding to Acute Kidney Injury Network stage 1 AKI) represents a much greater decrease in kidney function in cirrhotic patients compared with others who develop AKI (17). Cystatin C production is also affected by chronic liver disease, and it increases as patients progress from Child–Turcotte–Pugh stage A to C. Thus, as with serum creatinine, cystatin C also tends to overestimate kidney function, and it has not been proven to offer any advantages in assessing GFR over use of serum creatinine levels (18). Isotopic and radiocontrast methods can be used to assess kidney function in patients with cirrhosis, but they are susceptible to errors caused by redistribution within ascitic and extracellular fluid (19). In our patient, serum bilirubin concentrations were ≥15 mg/dl; the laboratory performed an enzymatic determination of serum creatinine. This assay is more accurate with greatly elevated serum bilirubin levels, but it is affected with bilirubin levels>20 mg/dl (19). As expected, the enzymatic creatinine assay gave a higher value of 0.99 mg/dl, which increased the Model for End Stage Liver Disease score (20), a prognostic index used for assessing short-term survival and determining liver transplant priority in patients with chronic liver disease and cirrhosis. As a simple practical approach, taking these factors into account, the true GFR can be estimated to be around one-half or less of the value estimated using a serum creatinine concentration in patients with cirrhosis. Although the criteria for diagnosis of HRS (Table 2) have been modified over time (10,21), it is only relatively recently that there has been some consensus over the definition of AKI (22). The majority of patients with HRS type 1 will meet the criteria for AKI, whereas some patients with type 2 HRS will fall outside the definition of AKI because of a slower rate of rise in the serum creatinine (23). In our patient, the serum creatinine on admission to the referring hospital was 0.69 mg/dl, and it rose to 0.91 mg/dl on transfer (Table 1). Thus, with serum creatinine, she did not fulfill criteria for stage 1 AKI; however, she was oliguric, and thus, she did meet urine output criteria for stage 1 AKI. After volume expansion with 20% albumin, urine output increased, and she no longer met this definition of AKI. However, the serum creatinine subsequently increased by >0.3 mg/dl over the previous 48 hours, and therefore, she once again met serum creatinine criteria for stage 1 AKI. The serum creatinine thereafter increased only marginally, and she remained in AKI stage 1 by serum creatinine criteria; however, because she became oliguric, she met stage 3AKI urine output criteria. Because patients should be staged for AKI according to the most severe criteria, she would be identified as having stage 3 AKI. The serum creatinine increased to >1.5 mg/dl. Therefore, she met criteria for HRS type 2, because although the serum creatinine doubled within 2 weeks, it still remained below 2.5 mg/dl (Table 2). Clearly, there are inadequacies in the definitions of AKI and HRS, and therefore, consistent and accurate description based on generally accepted criteria may not be possible in some patients. The discrepancy between serum creatinine and urine output staging of AKI is often seen in patients with liver disease, and it probably reflects the underestimation of kidney function by the serum creatinine that was discussed earlier. Can HRS Be Separated from AKI? The question arose as to whether she developed HRS, a specific pathophysiologic disorder, or simply had AKI caused by the combination of hypovolemia, hypotension, and perhaps, sepsis in the setting of underlying cirrhotic liver disease (24). Although nephrologists tend to view a very low urine sodium concentration as a cardinal feature of type 1 HRS, urine sodium was initially included only as a minor criteria for diagnosis of HRS, and then, it was subsequently removed entirely as a diagnostic feature (4,8,10,21). Classically, urine sodium, fractional excretion of sodium, and urine to serum creatinine concentrations are similar in patients with HRS and patients with volume-responsive AKI with liver disease, and they can potentially help to differentiate HRS from volume-unresponsive AKI (i.e., acute tubular necrosis) (Table 3). 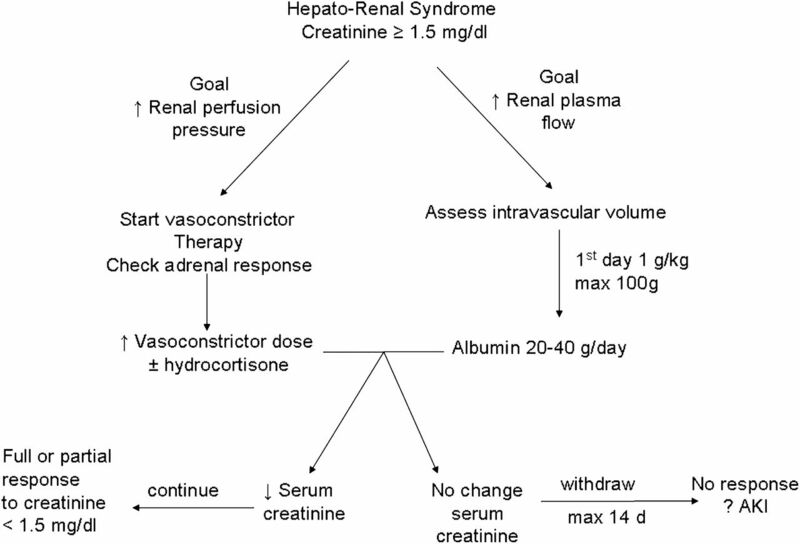 In clinical practice, these classic urine chemistry findings may be muddied by pre-existing CKD, previous administration of diuretics, and sodium loading with albumin solutions, but nonetheless, they can be clinically useful (25,26). Intrarenal blood flow is reduced in HRS, with reports of increased resistivity index measured with color Doppler ultrasound. It has been claimed that resistivity index is lower in patients with volume-responsive AKI (27) than patients with either volume-unresponsive AKI or HRS, although the extent to which resistivity index is clinically useful in differentiating volume-unresponsive AKI and HRS remains to be determined (27,28). Urinary neutrophil gelatinase-associated lipocalin (uNGAL) has recently been advocated as being potentially useful in distinguishing volume-responsive AKI from HRS (29,30). There is substantial overlap in uNGAL levels between volume-unresponsive AKI and HRS, particularly HRS type 1 triggered by sepsis (29,30). Therefore, the role of uNGAL in patients with AKI and cirrhosis remains to be determined. After volume expansion, our patient’s BP remained low, and therefore, her adrenal function was assessed by measuring a basal cortisol and response to synthetic ACTH. It was suggested that >70% of patients with Child–Turcotte–Pugh grade C liver disease have some degree of hypoadrenalism (31). However, in chronic liver disease, cortisol binding protein is often reduced, lowering total serum cortisol levels and making random cortisol measurements difficult to interpret. Free cortisol assays are now available but expensive. Salivary cortisol levels can also be measured, and they are equivalent to free serum levels. It has been reported that, for critically ill patients, the baseline serum cortisol should be >10 μg/dl, and an appropriate increase after synthetic ACTH is >9 μg/dl (32). In our patient, although the random cortisol was <10 μg/dl, the dynamic response was appropriate, and a decision was made not to give additional hydrocortisone. By day 5 of admission, our patient fulfilled criteria for HRS, and terlipressin, a vasopressin analog, was started. 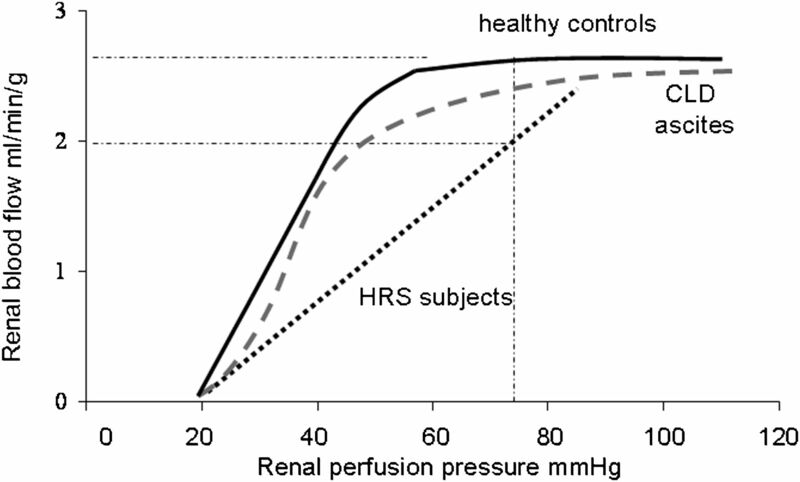 Traditionally, HRS has been described as a vasomotor nephropathy, and as such, increasing systemic arterial pressure can improve renal perfusion in some patients (9). Because there are more vasopressin receptors in the mesenteric circulation than elsewhere in the arterial circulation (33), vasopressin analogs were thought to have fewer systemic complications than other pressors. In Europe, terlipressin is the preferred vasoconstrictor (8), although it can cause coronary artery spasm and ischemia; therefore, it must be used cautiously in patients with coronary, peripheral, or cerebrovascular disease (8). Terlipressin was started at a low dose (0.5 mg three times per day) and then steadily increased over a few days up to 4 mg three times per day. In the United States, terlipressin is not available, and as an alternative, intravenous norepinephrine or oral midodrine are often combined with subcutaneous or intravenous octreotide. Small studies have suggested no differences between terlipressin and norepinephrine (34); an advantage of terlipressin is that it can be administered on general medical wards, whereas norepinephrine use is generally restricted to an intensive care setting. Terlipressin is more expensive than the other drugs used to mange HRS, but it is also more effective than the midodrine/octreotide combination. Only around 50% of patients treated for HRS with vasoconstrictive agents respond to treatment with a reduction in serum creatinine. This finding raises the question as to whether the patients who do not respond to treatment truly have HRS or rather, a volume-unresponsive form of AKI, such as acute tubular necrosis. As in our case, urine microscopy in such patients is often bland. Fractional sodium excretion <1% and fractional urea excretion <35% have often been used to distinguish volume-responsive from -unresponsive AKI (Table 3), but they have not been shown to reliably differentiate HRS from volume-unresponsive AKI (21,25). Similarly, color Doppler studies have not been able to show an intrarenal resistivity index above which patients are more likely to have established volume-unresponsive AKI or reversible HRS. Despite increasing the dose of terlipressin with albumin support and large-volume paracentesis, the serum creatinine did not fall. Additional large-volume paracentesis was performed, and terlipressin was withdrawn. The serum creatinine subsequently increased to 2.7 mg/d, and the patient remained oliguric. Because this patient had been abstinent from alcohol and the cause of underlying cirrhosis had not been established, she was treated with continuous renal replacement therapy; 7 days later, because urine output was improving, renal support was withdrawn, and she was subsequently assessed for possible liver transplantation. Dr. Ben Caplin: What are the roles of other aggressive or invasive treatments in pressor-resistant HRS? For example, is there a role for transjugular intrahepatic portosystemic shunt (TIPSS)? A.D.: TIPSS is typically used as a treatment for refractory ascites (8). Creating a shunt from the portal to systemic circulations immediately reduces overall liver blood flow with increased endothelin levels; renal plasma flow increases, which causes an abrupt fall in renal endothelin production. Closing the shunt has the opposite effects (35). These effects are thought to be predominantly caused by changes in visceral sympathetic activity. Although BP tends to fall, this fall is usually compensated for by increased cardiac output and cerebral and renal blood flow. As such, renal function usually improves after TIPSS. However, shunting portal blood increases ammonia entering the systemic circulation; thus, as in our case, TIPSS was contraindicated because of the raised plasma ammonia level and hepatic encephalopathy. Dr. Richard Fish: Are there any guidelines on the best dialysis prescription for these patients? A.D.: The Kidney Disease Improving Global Outcomes AKI clinical practice guidelines (22) recommend continuous renal replacement therapy for hemodynamically unstable patients using bicarbonate dialysate and infusion fluids to avoid dialysis-associated hypotension that could potentially lead to additional renal ischemic insults and delay or prevent renal recovery. Although patients with acute or chronic liver disease have prolonged standard laboratory clotting times and thrombocytopenia, they have increased risk of continuous renal replacement therapy clotting (36) because of increased tissue factor release and low levels of endogenous anticoagulants (proteins S and C and antithrombin) (37). Thus, anticoagulation may be required, and although citrate is a very effective regional anticoagulant, citrate metabolism may be impaired in patients with acute or chronic liver disease, leading to citrate toxicity. Unfractionated heparin may also be less effective because of reduced antithrombin levels. As such, lower rates of citrate infusion or low molecular weight heparins should be considered. In Europe, prostacyclin is often used, although use may cause hypotension. Intermittent hemodialysis and hemodiafiltration can be used, but they require modification using individualized high-sodium and cooled bicarbonate dialysate and extended session times. Dr. John Booth: Under what circumstances might renal biopsy prove helpful in the evaluation of AKI in the patient with chronic liver disease? A.D.: As with any patient with AKI, if there is a clue in the history, physical examination, or results of other investigations that there may a process causing AKI other than an episode of relative hypotension precipitated by volume depletion or sepsis on the background effects of chronic liver disease, then alternative diagnoses should be considered. If this patient had glomerular hematuria or significant proteinuria and renal size was normal, we would have considered a transjugular biopsy, because she was unable to cooperate for a percutaneous approach. Dr. Antje Furstenberg: What are the current data on fractionated plasma separation and filtration using the Prometheus device and albumin dialysis (molecular adsorbent recirculating system) in HRS? A.D.: There have been two recent multicenter clinical trials, one using the molecular adsorbent recirculating system and the other using the Prometheus device, reported in abstract form. Neither trial showed any significant survival benefit using these devices on an intention to treat analysis. Currently, there is no prospective trial of single-pass albumin dialysis. As such, the role of these devices and treatments in patients with acute or chronic liver disease and AKI remains to be determined (8). I wish to thank my hepatology colleagues Professors Burroughs, Jalan, and Moore.